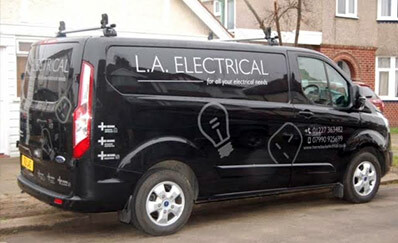 L.A. Electrical is a small electrical contractor based in Herne bay in the south east of Kent; we are a very reliable company and have been in business for over 15 years serving local businesses, Landlords and house holders. I’m a fully trained electrician, city and guilds qualified to 17th edition BS 7671, I’ve spent around five years at college to gain a number of qualifications, we are a registered NicEic approved contactor and a domestic installer (Part P Registered) and are Trust mark registered, fully insured and each year we have samples of work & equipment inspected by the NicEic inspector. Please see are services page for the range of work undertaken, including domestic services, commercial services, CCTV services and inspection & testing.